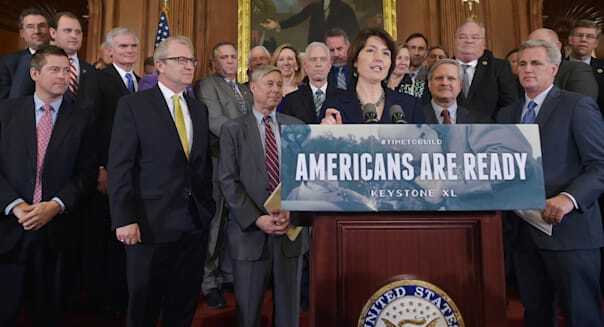 Mandel Ngan/AFP/Getty ImagesCathy McMorris Rodgers, a Republican representative from Washington, speaks during an event Wednesday supporting the Keystone XL pipeline. Barack Obama has promised a veto on the bill that would enable construction of the Keystone XL pipeline without a presidential permit. Without enough support for an override in the House, let along the Senate, passage of the measure seems unlikely. Given the political calculus was clear at the start, you might wonder why so many Democrats as well as Republicans voted for the measure. The answer may be money. Senators and representatives who voted for the measure received far more in campaign contributions from the oil and gas industry than those who opposed it, according to an analysis by watchdog group MapLight.org. Working from public contribution data collected by the Center for Responsive Politics, the organization matched votes on the bill to the money received by members of Congress from the oil and gas industry. House representatives who voted for the bill on average received 13 times more in oil and gas contributions ($45,375) than those who voted against it ($3,549). Democratic representatives who voted for the bill received, on the average, $18,141, roughly five times the $3,444 received by those who voted against the bill. Senators voting for the bill got 10 times the amount, at an average $236,544, than those who voted against it ($22,882). Democratic senators who voted for the bill, even though Obama had indicated his opposition, received 3.2 times as much as the Democrats who voted against it ($73, 279 vs. $22,882). Sen. John Hoeven, the Republican from North Dakota who sponsored the legislation, received $275,998. The contributions happened between Oct. 1, 2012 and Sept. 30, 2014. To say that more money caused the vote is not necessarily a foregone conclusion. It could be that the industry donated more heavily to candidates predisposed to support the bill. But the contributions did happen over a time that was of particular importance to political support of the bill.